< It’s official: The OSCM is fully Operational! Between the 14 Feb and 1 March 2018 expedition POS520 with RV POSEIDON and the submersible JAGO takes place off the coast of the cape verde island Santo Antão. The chief scientist, the JAGO team and participants of the cruise write here as guest writers. Today Henk-Jan Hoving, GEOMAR, Deep Sea Biologist, chief scientist. 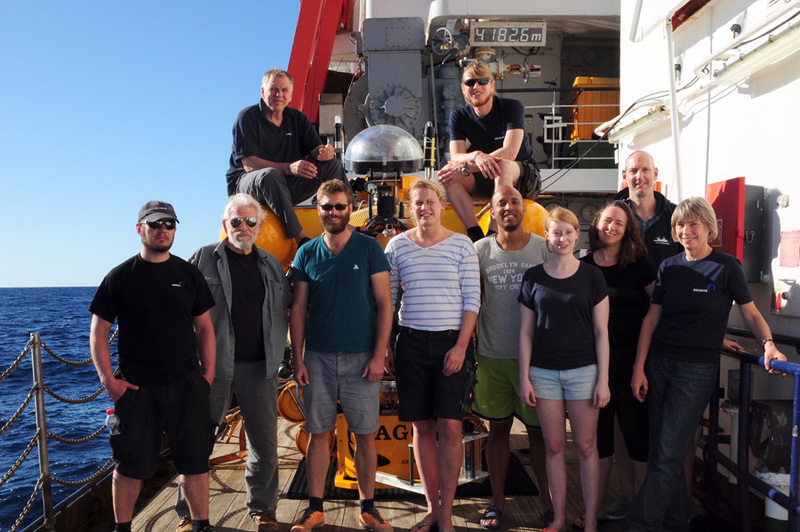 We are currently working on the German research vessel Poseidon, performing a scientific expedition in the vicinity of the islands of the Republic of Cape Verde. Our target environment is the pelagic deep sea, the water column below 200 m. While this is the largest environment on the planet, it is also the least studied marine habitat. The Cape Verde Islands provide an ideal location for deep water work since the waters around the volcanic islands have steep drop offs where deep sea is reached not far from the island. The high island mountains provide shelter and relatively calm conditions for instrument deployments. We use a combination of in situ observations (studying animals in their natural habitat) and net tows. The use of in situ observations in other regions has shown that gelatinous zooplankton (ctenophores, medusae, siphonophores) are a very abundant group of organisms in the water column, and the instruments that we deployed in the first half of our cruise definitely confirm this. Our cruise team is multidisciplinary with expertise in biology, oceanography, ocean physics and technology. To better understand the diversity and distribution of deep pelagic organisms in Cape Verde waters we deploy a variety of instruments. One of the instruments we use is the manned submersible JAGO, with which we have now performed seven dives to a maximum depth of 370 m. Later on in this blog, the submersible team will give their perspective on this cruise and how midwater operations provide a new challenge to their pallet of submersible experience. The towed camera system PELAGIOS is used to perform horizontal pelagic video transects in deeper waters, and we have deployed PELAGIOS down to 2500 m, a record depth for this instrument. First results from the in situ observations of JAGO and PELAGIOS show a variety of organisms, including crustaceans, fishes, gelatinous zooplankton, some of which we have not been able to identify yet. To complement our video observations and obtain specimens for morphologic and genetic analyses, we use a Multinet maxi, a device with nine plankton nets that can each be opened and closed remotely at a target depth and allows discrete zooplankton sampling down to 3000 m.
Some deep-sea organisms live in low densities, making sampling a challenge. However, new molecular genetic techniques allow for the reconstruction of diversity patterns using traces (e.g. mucus) that organisms leave in the water column. These traces are also known as environmental DNA. On this cruise we collect eDNA from different depths to establish diversity trends in relation to depth. In addition to biological data, we also collect information on currents, temperature, salinity and oxygen around the islands, allowing a reconstruction of the physical and chemical environment of the observed organisms. By combining our observations and collections we aim to obtain baseline information on organism distribution, abundance and diversity in the water column of the Cape Verde region.